Day 3 brought an unwelcome change in weather that continued through the next day - our last. Fortunately the morning and evening were okay in most areas. Only the Golden Gate Bridge decided to stay shrouded in fog for the next 48 hours straight. A huge disappointment to the tourist who had just arrived, but okay for us as we had bicycled to the base of it the day before. First stop early that morning was to the Cable Car station next to Ghirardelli Square. At that time of the morning the line-up was short. Although we could have jumped on the first car if we had sat inside, I wanted to be outside so waited for the second. \ As the cable car climbed the hill, there were a huge number of photos taken by the tourists standing on the sidewalks. Very strange to realize I was going to be in so many travel photos. We did opt for a shorter ride as our destination was the Cable Car Museum. 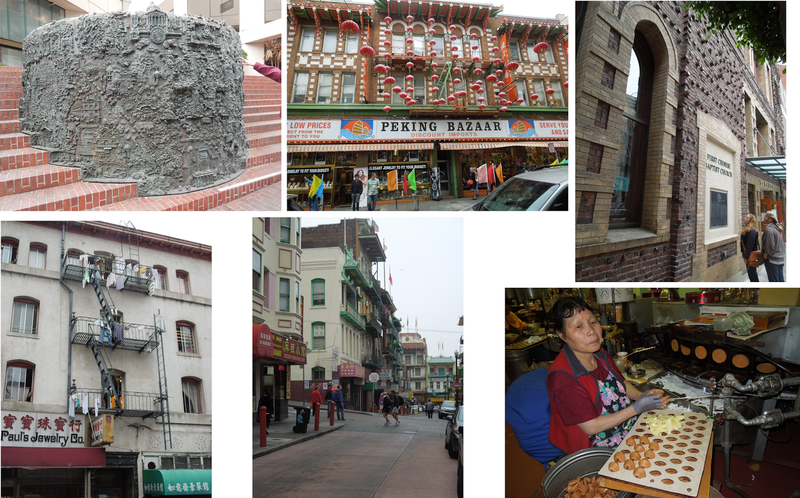 We arrived about 20 minutes early, so we decided to briefly explore the affluent Nob Hill district. in between others on Nob Hill. Later on the night bus tour I learned that Nob Hill used to be where the scum and low-lifes originally lived. What wealthy woman would want to climb a hill carrying her groceries and other purchases? With the advent of the cable cars this quickly reversed. It became fashionable to live on the hill. To this day Nob Hill features many top, 5-star hotels and private clubs. The hotels were obvious, but one beautiful building we went by had no signs anywhere. Finally we meekly snuck up onto the porch and found a small sign stating the name of the club and a note that it was members only. The message was clear. If you didn't know - you didn't belong there. By then the museum was open. When you enter on the street level you can walk straight forward to a railing that lets you overlook the metal shop where replacement parts are made as well as several large active cables rotating on gears. It's noisy so say the least. The museum side displays several old cars, vintage photos, some cases of parts, a great gift shop and a looped movie in the back that gives tons of information. From there we walked over to the start of the free Chinatown Tour that was a part of our package Hop-on-Hop-off Bus Tour. (Note - there are many companies in SF. We chose the Big Bus for the 2 free walking tours and night tour included in the 48 hour pass.) We lucked into an amazing guide that brought the history of the area alive - something that always interests me as much as the old architecture. We heard about street fights, a famous madam and more. One interesting story was shared when we viewed a vintage building - now a bank - that used to house the telephone exchange. In the early days there were no phone numbers in Chinatown. The female operators had to know 5 Chinese dialects, English and the name of everyone who had a phone so they could forward calls to the right place. Top left - the original figures on this sculpture were made in bread dough by a wide variety of people (including kids). Top Right - this building was built from damaged and burnt bricks scavanged after the 1906 fire was finally put out. Bottom left - you could often see laundry hanging on fire escapes drying. Bottom right - woman adding fortunes and folding the hot cookies by hand. The most interesting store? Sam Bo Trading Company where they had paper replicas of everything from houses, to cell phones, to clothes, to computers that you purchased and then burnt in a special vessel for your relatives in the afterlife. It was disrespectful to take photos inside the store and I cannot in a Google search find a good picture of these paper offerings. I also loved the walking up an alley and seeing the Golden Gate Fortune Cookie factory - the last to fold the cookies by hand. For $1 given to a very grumpy man you could take a picture of a very grumpy lady folding the fortunes into the cookies. 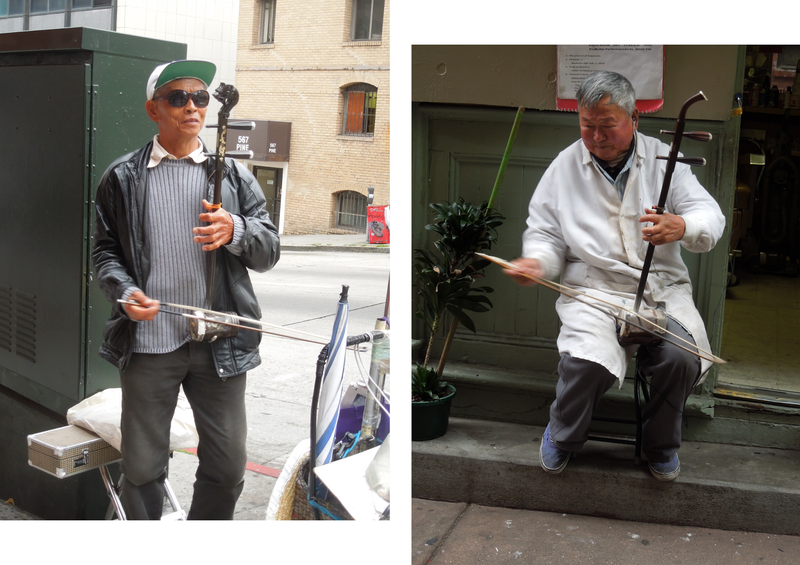 Next door was a very funny barber with one chair who played the Erhu for tourists (and tips) when his chair was empty. He was hilarious as well as talented. Turns out he was in an Eddie Murphy movie, but I can't remember which. At the end of the tour we jumped on the Hop-on-Hop-off bus and rode to our next destination, getting a bit of history along the way. We decided to pop by the Asian Art Museum on the recommendation of another tourist. On the plus side - they had a great cafeteria there where you could try many interesting dishes for a really reasonable price. Unfortunately, I wasn't as impressed with the art museum. The bulk of the collection was old terracotta religious statuary which does not personally hold my interest. There was some pottery and jewellery and some great puppets, but in the end I wish I had committed that time to the one of the attractions in Golden Gate Park - either the California Academy of Sciences or the de Young Museum. As we were going to be out in the evening we took the remaining loop of the Hop-on-Hop-off bus tour back to the wharf. 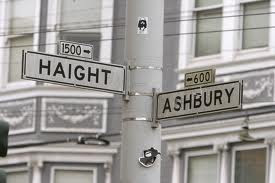 Loved seeing Haight Ashbury from the top of the bus and was very sorry we weren't going to get a chance to wander around this interesting, street that was such a focal point in my pre-teen years. The bus then took us over the Golden Gate Bridge with a stop on each end to drop off and pick up walkers. It was hilarious. The bridge was shrouded in fog from top to bridge deck, yet people were snapping photos (I guess of the white fog) and walking it's span. The ride over we were both huddled in our seats and plastered together to try and keep warm as we were pummeled with the wet fog - laughing all the way. How strange to be sunburned one day and frozen the next. Back at the hotel we munched some on salads from a local store and had a bit of downtime. Then it was back to the Hop-on-Hop-off bus for the night tour. We were lucky again. Earlier in the day we were on buses with taped tours. They're just not as good. This bus we had the same guide who walked us through Chinatown. There was enough light at the beginning to explore some new areas. Most interesting fact I learned? During the famous fire in 1906, they decided the only way to stop it was a fire break. They picked one street lined with beautiful Victorian homes and the military came in. Those on the fire side were forcibly evicted and their homes blasted to smithereens to create the fire break - those on the other side came back to intact homes. Remember back then there was no house insurance or government to reimburse you. Neighbors either lost it all or kept it all! 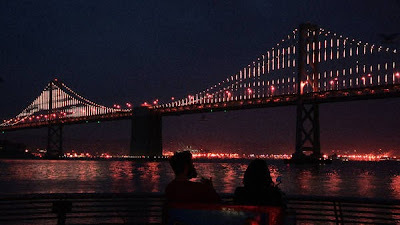 The tour bus literally careened down the very steep California Street like a roller coaster ride - even the guide seemed a little taken aback - and then proceeded across the Bay Bridge to Treasure Island where we could view the night skyline. San Francisco is working on being a green city, so the lights at night were not as spectacular as others I had seen. Back on the city side we could view an alternating light art installation on the bridges vertical cables. Shortly thereafter, I was ensconced in a nice hot bath reminiscing about what a great day it was despite the change in the weather. Definitely memorable.